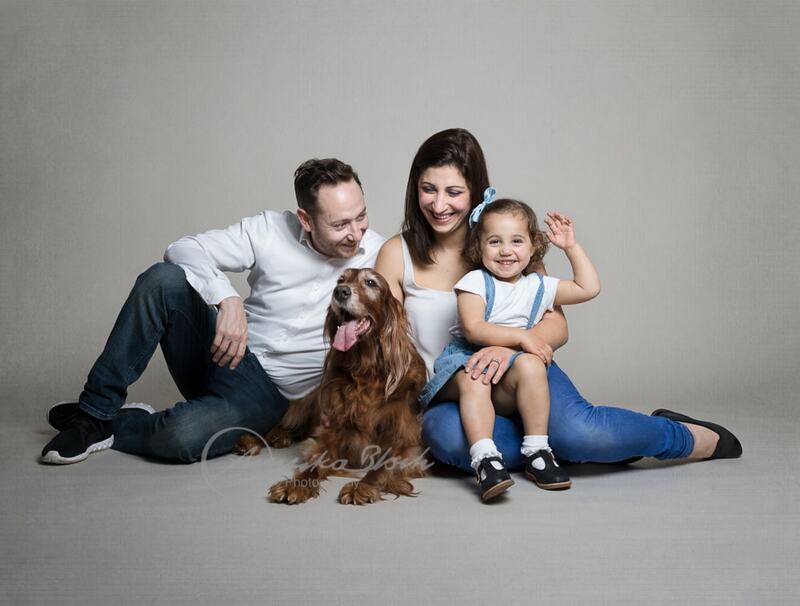 I took on a challenge a short while ago: A family photo session in the studio with the family dog and a very sweet toddler! I was really looking forward and also very curious how this would go. I tell you, I made extra sure all the lights and the backdrop stand would be super secure!! After all, this was not a tiny little lap dog, but a beautiful (and rather tall) Irish Setter. But I really didn’t have to worry: she was unbelievably well behaved and patient. The family mainly wanted a portrait of all four of them together and I tried to work a quickly as possible while the little girl and dog were happy. The beautiful dog actually had to have a little operation a short before the photo session and unfortunately had to have quite a bit of fur shaven off for this. Luckily, she was happy to be posed so it was not too visible and the rest could easily be done with a little photoshop magic. 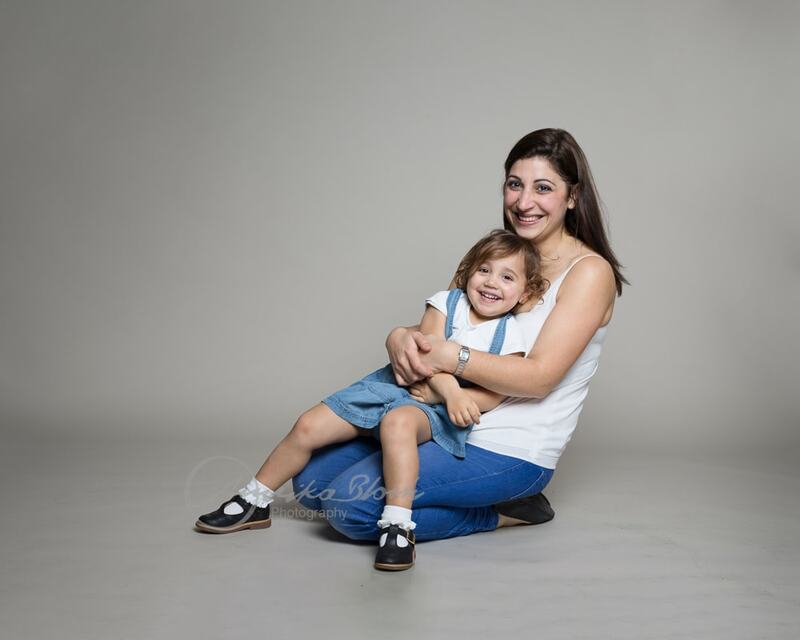 Our two-year old super star was being a two year old and had her own ideas about where to go, what to do and who to be photographed with. It was best to go with the flow and some fun with dad and a tickle with mum still produced some very sweet parent-daughter moments. Some little props, like a flower or a balloon made her smile, too! And of course, what never fails with a little dancing queen? Baby shark! She was showing off her best moves in no time and I was inspired to capture her little dance routine in a panoramic collection. 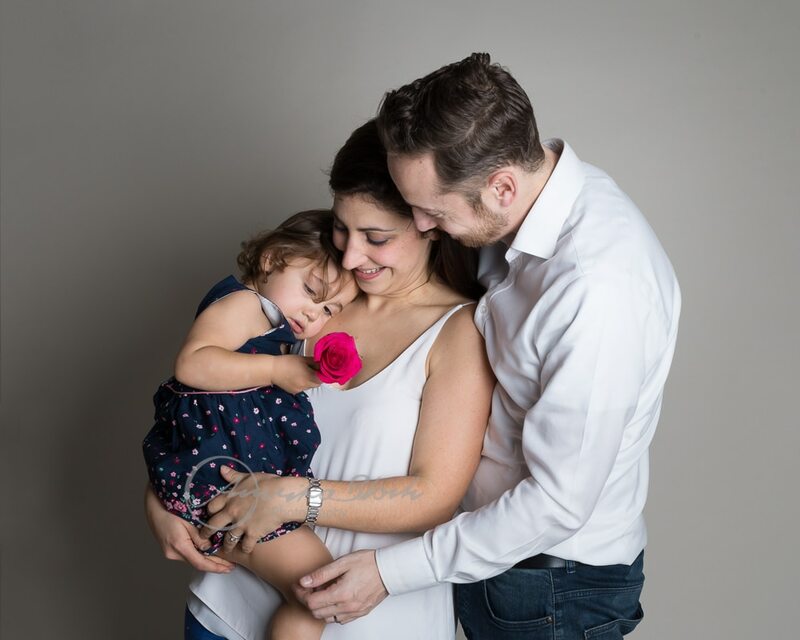 And when our little lady got tired, this was the perfect opportunity for some more intimate family portraits. After all, cuddling is a big part of parenthood! I am once more taking part in a blog circle with some photographer friends of mine. We’re linking to each other’s posts, so you can check out what they’re up to. To see a completely different family session in a stunning autumnal forest have a look at this post by Aberdeen Family Photographer Iana Chtefan. I just adore those golden colours! Follow the links on each post of the circle to see more family photography until you are back here. 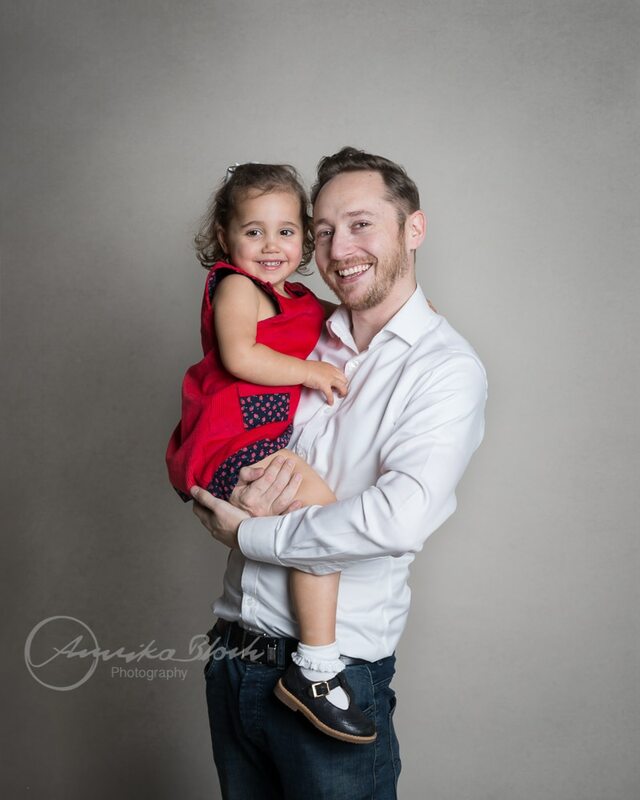 And maybe you find some inspiration for a photo session for your family – let me know and I am happy to make things happen! I absolutely love when families include their pets! I’ve photographed a 200 lb tortoise before! Great job with both the toddler and the pup! So cute!! Thank you! 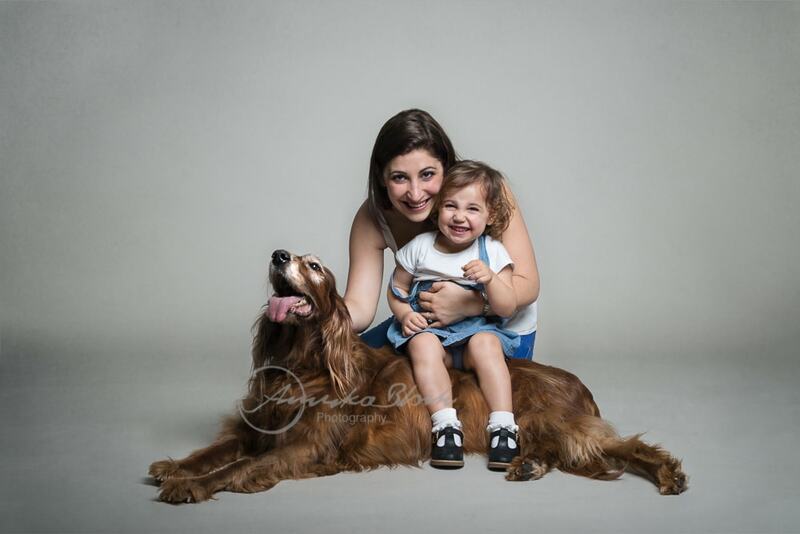 I hope I will have the chance to photograph more pets – I absolutely loved it! That session with the tortoise must have been awesome! Oh my goodness – I LOVE your studio! What beautiful work! 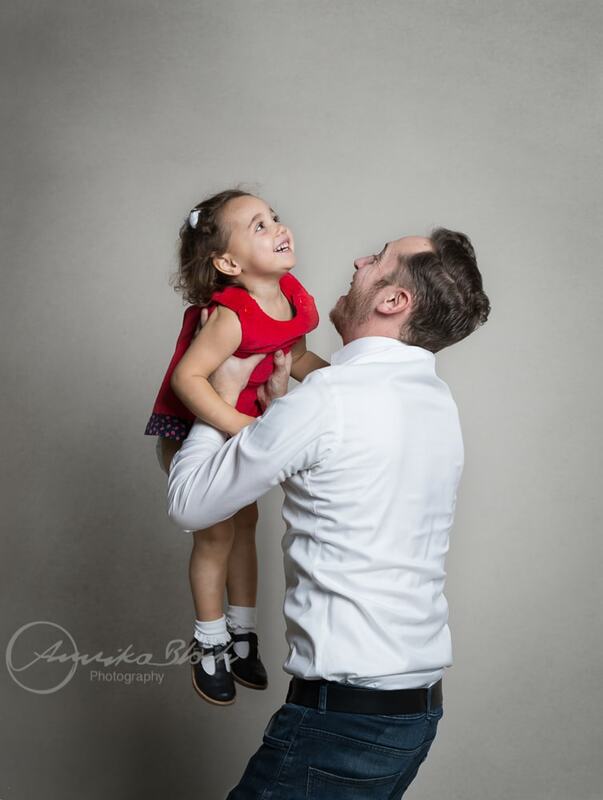 I especially love the one with the five shots of the little girl – so adorable to see her personality! Beautiful work! Thank you, that is very kind of you to say! She is a really adorable little girl, so much fun to photograph and so sweet with the dog! ok now I have that song stuck in my head! Great studio shots! Such a cute family! Beautiful pictures Annika! Haha! I love that title, it immediately made me laugh! And the multiple exposure of the little cutie is so creative! Thank you! 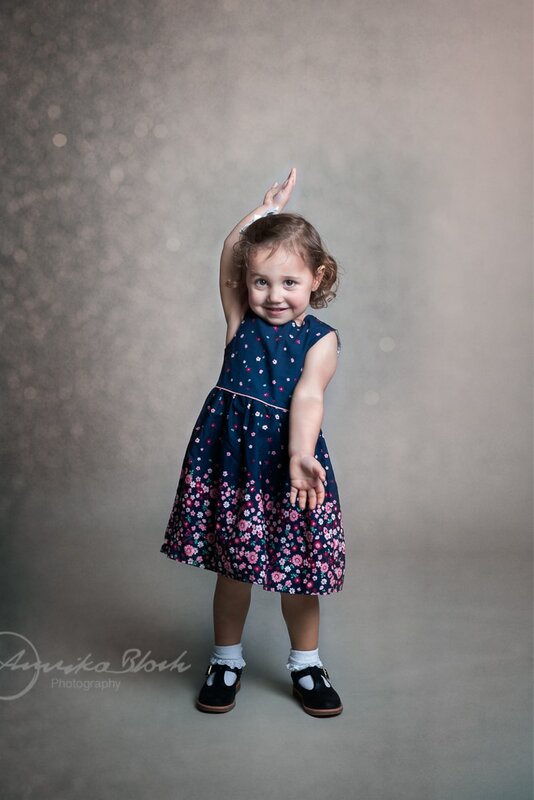 I just love to see the little ones dance or jump – so why not capture it this way?